I still remember very well first hearing Rock Bottom back in 1974. My friend Ray Kent bought it before me and played it to me. He described it as soft rock. 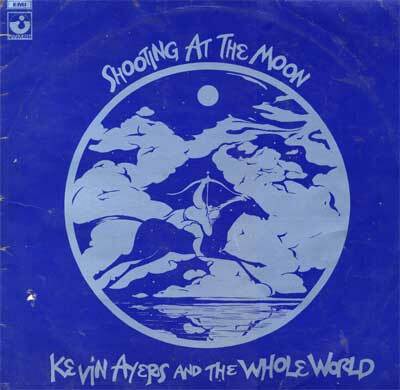 My favourite British rock/pop albums are The Madcap Laughs, Rock Bottom and Shooting At The Moon. What have all 3 got in common? The contribution of Robert Wyatt. I like the song Alabama Bound so much that I wrote a sort of tribute song which I call Belerion Bound. I don’t play it too often, maybe I’m too much of a Puritan to want to emphasise it’s hedonistic agenda. Actually it’s called Don’t You Leave Me Here and is by Papa Harvey Hull & Long ‘Cleve’ Reed. It’s hard to remember just what impact David Bowie‘s Station To Station had back in 1976. It takes me back to the sitting room of my friends Rod & Sheila Henderson in Hyde, Manchester. The still from The Man Who Fell To Earth on the cover seemed to hint at things that were extra-terrestrially incumbent. Actually the film came out earlier in the year, before I was living in Manchester. The film I associate with my short time there is another offering from that year, Taxi Driver. That’s something for another time. There is much to write about it seems. Which leads me to the soundtrack of another 70s film, Roma. I didn’t get to see this film until 73 or 74 and I have a vague memory that I saw the end of the film (the motorbikes bombing around Rome) first as the previous screening hadn’t finished when I took my seat. It’s not a good idea to do that, although not too bad with a film like Roma. I first saw John Cale perform on June 1st 1974. That’s easy to remember because the concert was recorded and came out on an Island Records album and that’s what they called it. Sun Ra I think I saw twice, both times at The Venue by Victoria station. And in reference to the earlier paragraph, that was somewhere I also saw John Cale do a solo gig on his first solo tour and I saw Nico do a solo gig there once too. Monk sadly I never saw. I’m working on a guitar solo version of Pannonica and have been doing for a while now. It’s going to take me a little longer before I contemplate playing it live, but one of these days. Misterioso is another of my favourites. I’ve seen the Kronos Quartet a few times. The first album I bought with them on was Terry Riley‘s Cadenza On The Night Plain. There is much to listen to it seems. Finally back to 25th December at Rod & Sheila’s in 1976. My best Christmas present was the box set of Keith Jarrett‘s Solo Concerts. I may have played one of the sides sometime that Christmas morning. Afterwards I left the triple album in its box on top of the TV set. It’s never a good idea to leave records on the top of the TV. Especially not on Christmas Day in 1976. Later that afternoon I found that the records had sort of changed shape and not much of the vinyl was left in a listenable state. So this recording of Side 4 of the record is from my 2nd copy of the album (although I’m afraid it has some vinyl defects near the end). I should point out that this last track is a couple of minutes over 20 minutes long. Thanks for listening and finally I would like to copy out the words of a poem by William Carlos Williams. I don’t know why exactly but the desire hit me a little bit earlier. This entry was posted in geology, mixes and tagged david bowie, federico fellini, ivor cutler, john cale, keith jarrett, kevin ayers, kronos quartet, long cleve reed, martin scorsese, nino rota, papa harvey hull, robert wyatt, sun ra, terry riley, thelonious monk. Bookmark the permalink.